My grandmother is about to turn 80 and suffers from spinal stenosis, a degenerative disease marked by the narrowing of the spine in one or more areas. Because of this, my elderly grandmother walks with a cane and also uses a wheelchair. She is subject to frequent back pain. When we decided to travel from Philadelphia, Pa., to West Palm Beach, Fla., to visit my mother, it was the first time either of us had brought a wheelchair on our travels. We had to be a bit more mindful of pain management and communication issues. As a chronic back-pain sufferer myself, I understand how some days are harder than others, and how a back-pain sufferer can feel simultaneously mentally awake and physically exhausted after a day of travel. Here are some things I learned to make future travels easier. The easiest way to help others prepare for a spinal stenosis patient is to make arrangements ahead of time. This includes notifying the airline. My grandmother and I traveled to the airport via hired car. When we made the arrangements, we let the company know that it would take some more time because my grandmother is elderly and suffering from back pain. Many people with spinal stenosis take prescribed pain medication. As someone who also suffers with back pain, I understand how important it is to have access to the right medication at the first sign of pain. Fortunately, my grandmother packed her prescriptions in an accessible location and followed the TSA guidelines (medication should be in its labeled container and then placed in a clear plastic bag). Like many with spinal stenosis and other back injuries, my grandmother can do limited walking with a cane. Her doctor recommends minimal, manageable mobility. 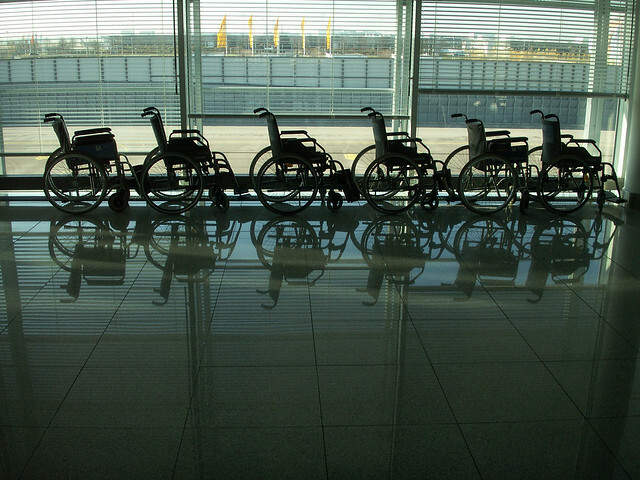 When we traveled, my grandmother primarily remained in her wheelchair. However, we kept her cane accessible as well. This turned out to be very useful, particularly when it came to bathroom trips and navigating down the aisle of the airplane. Additionally, I had to ask for more information in person, especially when it came time to board and disembark the plane. Even experienced professionals sometimes are not sure about how to treat a person who is in a wheelchair or struggling to walk. As my grandmother's caretaker, I found that I had to be particularly clear and assertive at the airport. Instead of asking for the nearest elevator, I had to say, "We are going to Terminal B and my grandmother is in a wheelchair. What is the best way for us to get there?" I found that most staff wanted to be helpful, but were afraid of offending us by assuming that my grandmother and I couldn't manage on our own. I learned that it helped to specifically explain what my grandmother felt comfortable doing before asking for help. When we were ready to board our flight, I told the helpful flight attendant, "My grandmother can walk down the aisle using her cane, but we will need help stowing our luggage." When traveling with a spinal stenosis patient, careful preparation and specific communication greatly minimizes stress. This content was originally published on Yahoo Contributor Network.